One of the most important things I impart to my students is that we cannot control others...we can only control ourselves. We wants others to be different...think differently, act differently, dress differently. And we become frustrated when they don't or won't change. One thing we rarely think about is that each of us is an "other" to someone else. We have this idea that what we're doing is what should be done. It makes perfect sense to us, so how could others not want to see things our way. Each of us will change in our own good time. 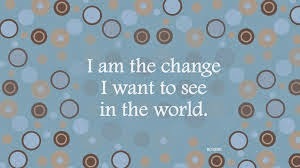 One thing that may amaze us is that when we change, the change we desired in others has happened too.